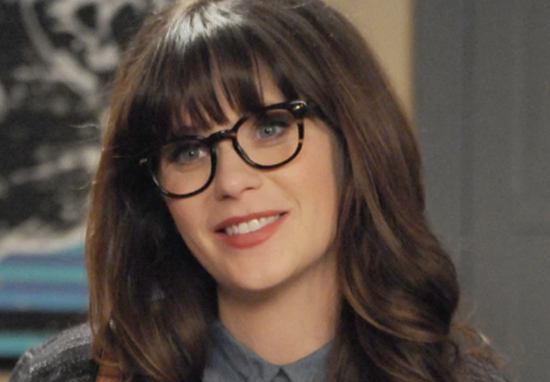 Zooey Deschanel is well known for her quirky, offbeat look; complete with hipster glasses and a cutesy fringe. So fans didn’t know what to think after a picture emerged showing the 38-year-old Manic Pixie Dream Girl swapping her glossy fringe for a sleeker, more mainstream look. Fans were shaking as they considered this new, alternative Zooey. Would she still possess the unicorn powers required to transform the outlook of angsty young men? Would she still run on pure glitter and Lucky Charms? The photograph in question was taken during the Met Gala back in 2013. Zooey looked fresh and feminine in a striped, asymmetrical Tommy Hilfiger dress; completing the look with a hot-pink Edie Parker clutch bag. The theme for the evening had been ‘punk,’ which Zooey alluded to in a subtle manner with her safety pin clutch. Steering away from her usual full lashed, dolly make-up; the New Girl actor opted for minimal coverage, using an earthy palette to achieve a natural, glowing appearance. Understandably, many people refused to believe this was the beautiful bundle of sweet, life-affirming flaws and idiosyncrasies they’d come to know and love. Comparisons were drawn to Clark Kent whipping off his own spectacles when transforming into Superman, with Zooey’s kryptonite surely being tempted by a wistful sing-along while trying to save the world. This is simply not the same woman. That’s not her. I refuse to accept that as truth. NO WAY THATS NOT ZOOEY!!!! Zooey recently bid a fond farewell to New Girl after having played loveable, kooky schoolteacher Jess for seven years. We’ve been working on the show for such a long time, and it’s hard to make this many episodes of a show. It’s like a real feat, and I’m very proud of having done such a huge volume of television, tut it was definitely time to move on to other things. It’s bittersweet because I miss all my friends, and I loved everybody that I worked with so much. It’s kind of like high school, where it’s this thing that has been a constant in my life for seven years. It’s been with me [as] I got married, I had two kids, and all these people, I’ve become close with— the cast and the crew. It’s been kind of like the centre of my life for so long, so it’s really important for me, personally as well as professionally. I remember how thrilling it was to meet each and every one of these actors- and how, at a time when I wasn’t sure about the entertainment business, our rapport reminded me of why I love acting. Thank you @mrjakejohnson @lamorne @therealhannahsimone @iammaxgreenfield you are all amazing. And a special shout out to @mrdamon2 who is in this picture in spirit! Now if we could just see fringe-less Zooey falling over into a pile of jelly babies then we can begin to fuse the two personas together.